Have you heard the news? 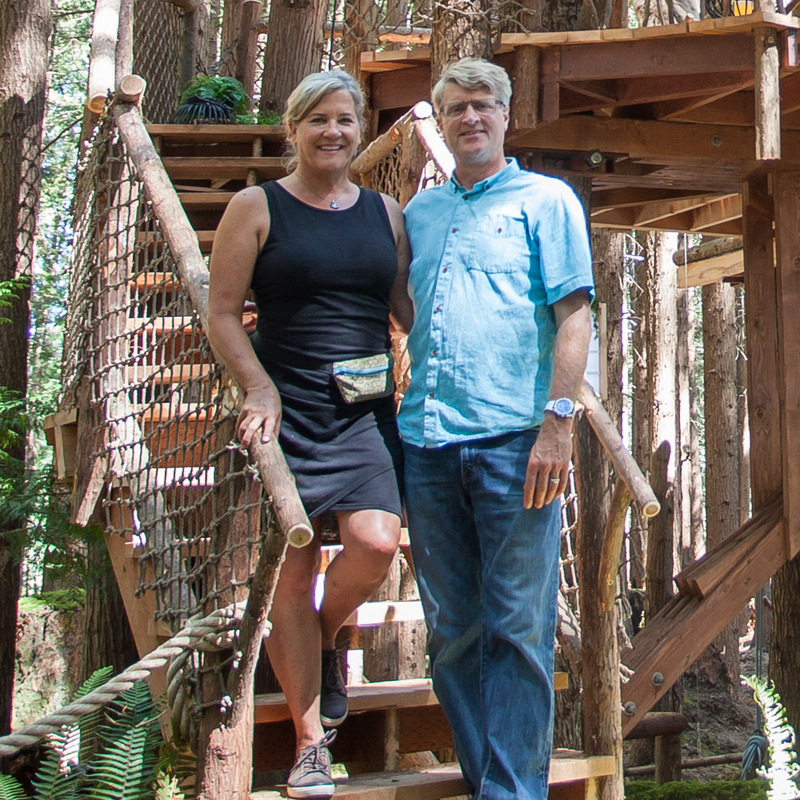 Pete Nelson partnered with Laurel Waters, chef and owner of The Laurel Tree Restaurant, to open Treehouse Utopia, a luxury treehouse retreat in Utopia, Texas. 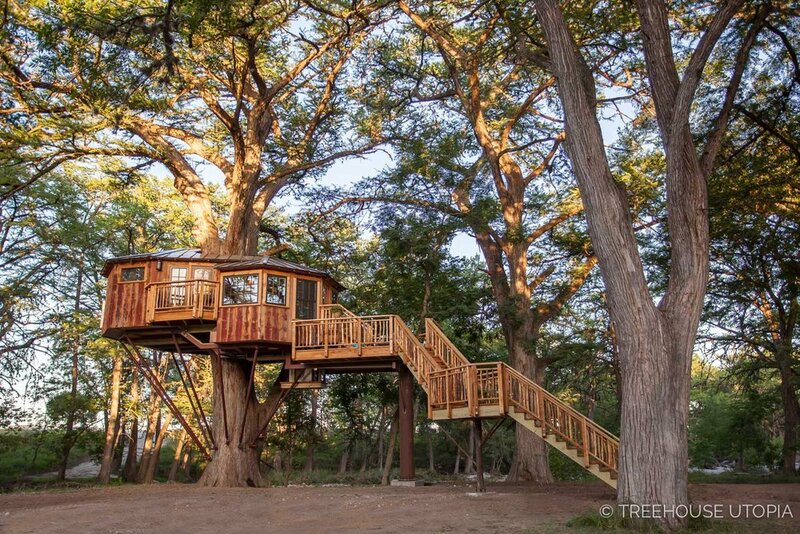 You can now stay up in the trees in Texas Hill Country! Booking is currently open for dates through December 2018 and reservations are made online at treehouseutopia.com. With its four rentable, private treehouses and natural splendor, this romantic retreat exudes magic. 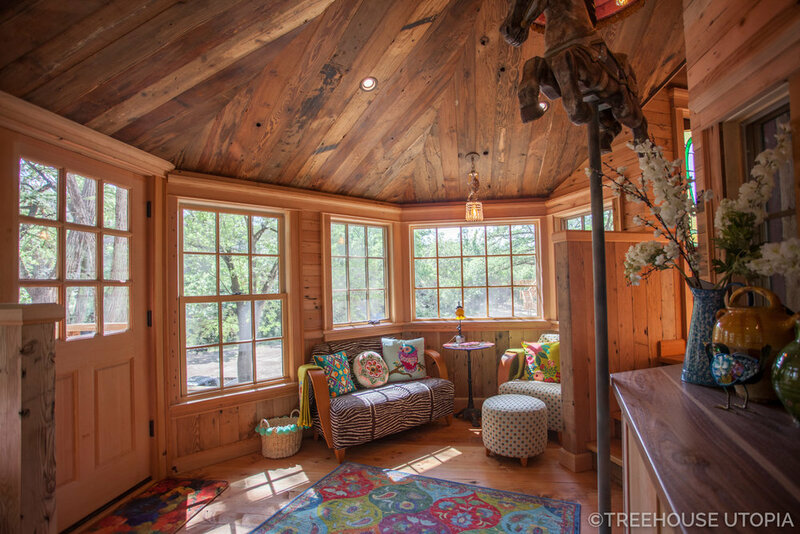 Read on for a look at one of the retreat’s treehouses: the whimsical and bright Carousel. Nestled in a single cypress at Treehouse Utopia, Carousel offers prime views of the river and lush canopy. Carousel is the resort’s most whimsical treehouse, imbued with cheerful colors, playful decor, and one-of-a-kind fixtures, including a chandelier made from a vintage carousel horse. On her visits to France, owner Laurel Waters was charmed by how carousels are often placed at the heart of towns. Carousel at Treehouse Utopia shares this central positioning, rooted between two treehouses (Chapelle and Chateau) and looking out toward the third (Biblioteque). The design process for this treehouse was iterative and playful. After Pete drew up the original plan, our lead architect Daniel Ash flew down to browse Laurel’s collection of antiques for design inspiration. Daniel and the design team went through a series of concepts before landing on the final plan. Ultimately, Carousel swirls around the single cypress. Its two-leveled substructure creates a subtle undulating aesthetic, much like horses on a merry-go-round. The varying levels and asymmetry of the steel substructure made it tricky to install—the entire steel frame had to be welded in-place. It required a great deal of finesse to calibrate the rigging to fit the steel components together and level them off. Another construction challenge was reaching the side of the treehouse that overhangs the river. Our intrepid crew built scaffolding to install windows and paneling on that face. A grand staircase climbs up to the entryway and front porch. At its highest point, Carousel rises 17 feet from the ground. Laurel Waters and Pete Nelson standing at the base of Carousel. A cheerful porch greets visitors at the treehouse entry. Just inside the door, guests can grab a bite at the table while soaking in spectacular views of the Sabinal River. Laurel worked with our crew to craft this custom chandelier from an antique carousel horse from her personal collection. Sunshine streams into the seating area, thanks to large windows by Integrity. A coffee bar and mini fridge round out the seating area. This room is the first stop on this treetop carousel—on their way through the treehouse, guests walk nearly 360 degrees around the central cypress. Stained glass adds pops of color throughout. The brownstone door to the second deck is reclaimed from a building in England. This sweet deck is the perfect spot to soak in the Texas sunsets and starry night skies. In total, Carousel has three decks: one at the entry, one western-facing, and one at back with views of the river. Back inside, the spacious bathroom holds a tiled shower and toilet. The luxury bathrooms at Treehouse Utopia really take the treehouse experience to a whole new level! The master bedroom includes a queen-sized bed and reading nook with sweeping riverside views. Laurel crafted the one-of-a-kind headboard from an antique carousel panel she found on her travels through France. The corner reading nook is a special spot—its unusual angles allow it to extend over the river for optimal views. Like all rooms at Treehouse Utopia, Carousel has heat and air conditioning. The bedroom opens directly to the private back deck, which winds between enormous branches of the host cypress. Sitting on the deck is like being transported to a different world. Below, sunlight sparkles off the river, while above, birds sing in the cypress canopy. Treehouse Utopia is an ornithologist’s paradise, as the property is frequented by over 200 species of birds! 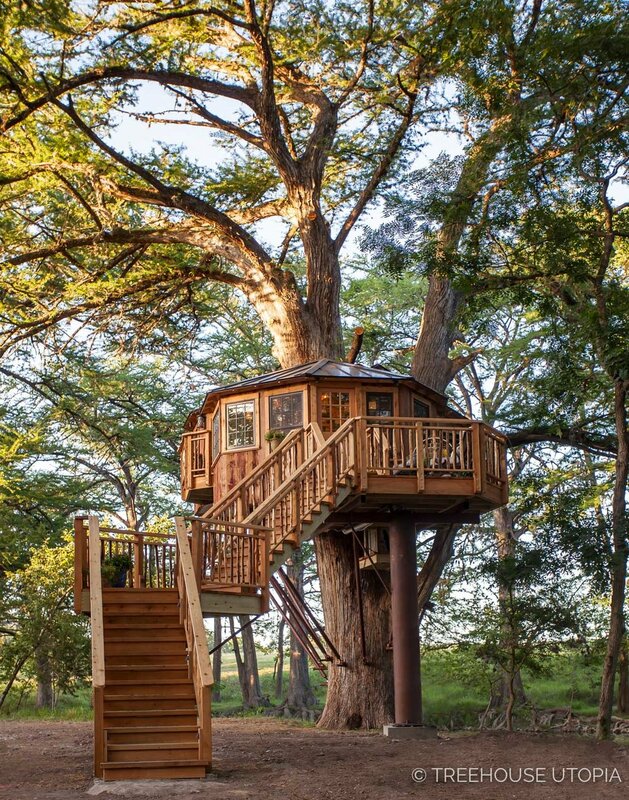 We hope you've enjoyed taking a look at this whimsical treehouse retreat! You can book your stay in Carousel at treehouseutopia.com. 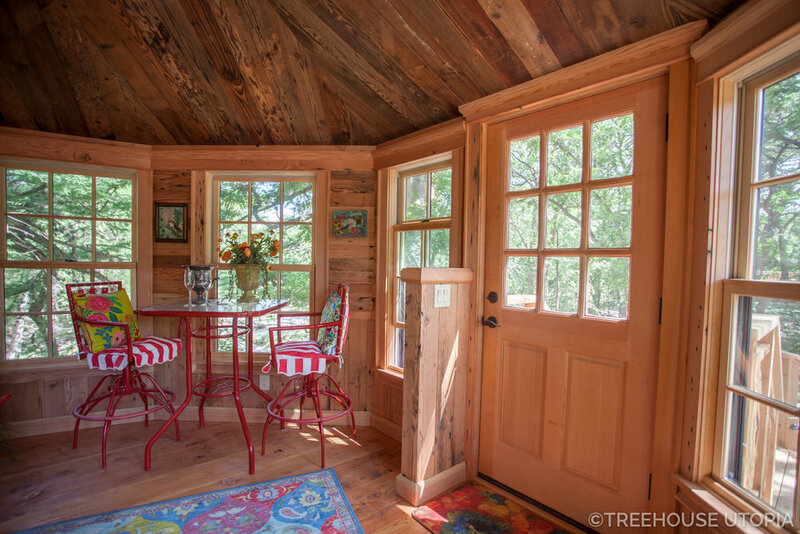 Click here to learn more about Treehouse Utopia. 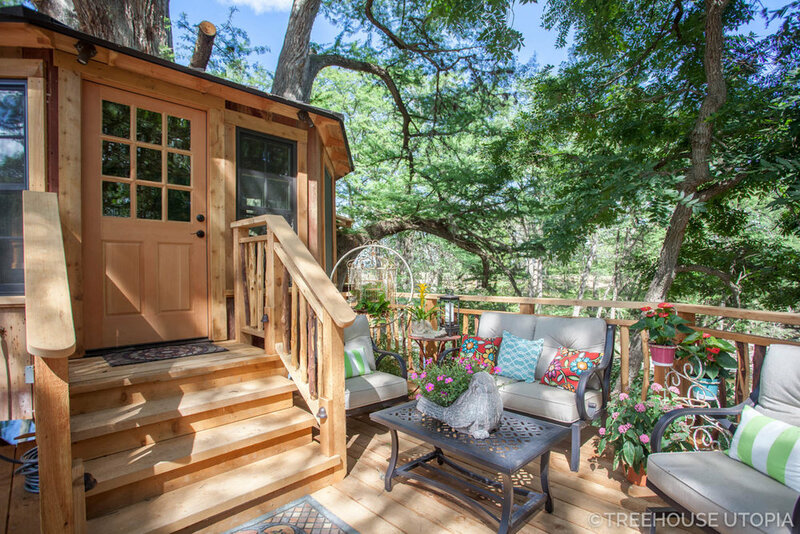 And find answers to FAQ about Treehouse Utopia in this blog post.